A Coffee Morning was held in the Parish Room on Wednesday 24 April in aid of the Alzheimer’s Society. Our Easter Sunday Services were held in Church at 8.30am and 11.00am followed by a Baptism. It was the last service led by Jason who had been seconded to St. John’s and St. Luke’s during the Lent and Easter season. A big THANK YOU went to the ladies who helped to decorate the Church for Easter and to all who gave donations towards the cost of the flowers. Our Good Friday Service was held in Church at 10.30am, after which the alter was stripped of it’s ornaments and cloths. At 12.30pm an Ecumenical Service was held outside St. Luke’s. A Communion Service was held in the Parish Room on Maunday Thursday 18 April at 10.30am. The service was followed with Flower Arranging by the ladies, in preparation for Easter. The Walking Group walked around Ripponden Wednesday 17 April and finishing at the Booth Wood reservoir. Our monthly Taize Service was held on Wednesday 3 April. The Heywood Parish Lent Lunches were held at St. Joseph’s on Wednesday 13 March followed on the 20 March at St. Luke’s, then Heywood Baptist Church on the 27 March, St. John’s on the 3 April and finally Trinity Methodists on the 10 April..
Our Taize Service was held on the 6 March was followed by our evening Ash Wednesday service. Our monthly Coffee Morning was held in the Parish Room on Saturday 23 February. Taize Service was held in the Parish Room on the 6 February. Our monthly Coffee Morning was held on Saturday 26 January. The Walking Group enjoyed a delightful walk round Jumbles reservoir on the 23 January. The clear blue sky and the snow decorating the trees were a beauty to behold. Hopwood Community Group met on Tuesday 22 January. Taize Service was held in the Parish Room on the 2 January 2019. On the 26 December we had refreshing walk round Heaton Park. Our services over the 2018 Christmas Period – Sunday 23 December 11.00am Family Carol Service with Holy Communion. Christmas Eve 5.00pm Crib and Christingle Service. Christmas Eve 11.45pm Midnight Communion. Christmas Day 11.00am Family Service of Holy Communion. Our monthly Coffee Morning was held on Saturday morning 15 December. Our Hopwood Community Group Christmas Party was held in the Parish Room on Tuesday 11 December. Our annual Autumn Fair was held in the Parish Room on Saturday 24 November and proved to be successful in raising funds for the church..
St. John’s held an enjoyable Quiz Night in the Parish Room on Friday 16 November. The evening started with a choice of Meat and Potato or Cheese and Onion pie. 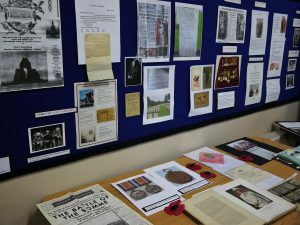 Our Remembrance Open Day and Exhibition to commemorate the centenary of the end of the First World War was held on Saturday 10 November. 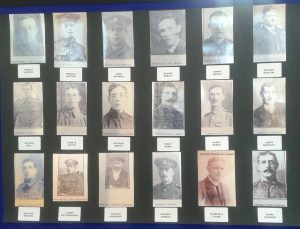 In Church and the Parish Room there were displays to remember the men from the parish who died in the war. There was a prayer tree in church for visitors to attach messages, if they so wished. Light refreshments were available throughout the day.The event raised £427 in donations for ‘Help for Heroes’, which we topped up to £500. The following day we held our annual Remembrance Service when we observed the two minutes silence and the names from the War Memorial were read out.to commemorate a hundred years since the end of World War 1. 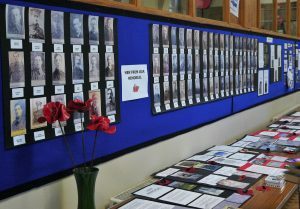 Names of those members of the forces who died in World War 11 were also read out. Our monthly Taize Worship was held in the Parish Room on Wednesday 7 November. Our Sunday morning service on the 4 November incorporated our annual Shoebox Appeal. Carol Hartley visited and gave a talk and collected 149 shoeboxes for distribution to orphan children in Belarus. A further Work Morning was organised for Saturday 3 November to sweep up and bag the autumnal leaves. A good crowd turned up to clear the leaves and carry out other maintenance work. Our monthly Coffee Morning was held on Saturday 27 October . Our walk on the 24 October was around Greenmount, Bury. A fine day and a fine meal at The Robin Hood in Tottington. We welcomed Alivia Clare Ellen Beswick, Ty and Archie Garner and Callum Derek Paul Wolstenholme for Baptism on Sunday 21 October. The Charity Brass Band Group and St. John’s Choir Concert, plus poems read by Lesley Lees, held on Saturday 20 October, proved to be a success, with a good attendance. £650 was raised for maintenance work on the church building. A good crowd joined our Work Morning on the 29 September. A general tidy up outside in the garden was the order of the day, together with some indoor maintenance. A further morning has been arranged for Saturday 3 October to sweep up and bag the autumnal leaves. Our Coffee Morning held on Wednesday 26 September raised over £400 for the Springhill Hospice. Our monthly Coffee Morning was held on Saturday 22 September. Our walk on the 19 September was round Dove Stones reservoir in Greenfield. A blustery walk it was. Lunch was at the Clarence Hotel in Greenfield. A dedication of a Votive Candle Stand was held during our Sunday morning service on the 16th September. It is a gift by Rev. Robert Whyborn in memory of his late wife,Margaret Ann Whyborn and dedicated to the glory of God. We welcomed Harry David Stewart for Baptism on Sunday 9 September. We celebrated the wedding of Jason Ward and Cheryl McKinnon on Saturday 1 September. We welcomed Riley Benjamin Forshaw for Baptism on Sunday 26 August. Our monthly Coffee Morning was held in the Parish Room on Saturday 25 August. Our walk on the 22 August was through Redisher Woods, Bury. Lunch was at the Hare and Hounds in Holcombe, Bury. We welcomed and Kalen Dean John Christopher King and Ruben Ian Burns for Baptism on Sunday 19 August. We welcomed Emily Rose Sorah and Ava Helen Burrell for Baptism on Sunday 5 August. Our monthly Coffee Morning was held in the Parish Room on Saturday 28 July. Our walk on the 25 July was along the Bridgewater Canal from Worsley and return through the Worsley Heritage Trail. Lunch was at the Barton Arms in Worsley. The funeral of Marjorie Farrar was held in church on Monday 23 July. We welcomed Jake Stephen Dawson and Molly Joan Sanderson for Baptism on Sunday 22 July. Our Priest-in-Charge, Rev. Shirley Devine, has regrettably taken early retirement on ill-health grounds. Her last day was Sunday 15th July when she led our intersessions. In her farewell message she donated a stained glass picture of the three wise men and baby Jesus and a stained glass Epiphany Cross to St. John’s and St. Luke’s for use in our services. Afterwards, in the Parish Room, Rev. Robert Whyborn thanked Shirley for her ministry to our two churches, bade her a fond farewell and presented her with a cheque representing donations from the congregation. We will continue to pray for her and her family and wish them well in the future. At that time, we will be entering a period of Interregnum, before a new incumbent can be appointed and St. John’s PCC will be working with our Archdeacon to ensure this is done as speedily as possible. There is a message on the Vicarage telephone number 01706 629803 advising callers where they can obtain assistance. Contact with St. John’s church can also be made on email via this website. We welcomed Roman Luke and Robert Williams for Baptism on Sunday 8 July. Our Coffee Morning in the Parish Room was held on Saturday 23 June. Our monthly walk took us round Affetside, near Bury. Beautiful scenery, beautiful weather and an excellent lunch at the Pack Horse. We welcomed Harriet Hawkins for Baptism on Sunday 24 June. We welcomed Avaya Moss and Lee Green for baptism on Sunday 17 June. Our Work Morning on the 15 June was well attended, enabling us to keep the gardens and paths tidy and to carry out necessary routine maintenance jobs in the church. We welcomed Dylan George for baptism on Sunday 10 June. We welcomed Alice and Dexter Crombie for baptism on Sunday 3 June. The Wedding of William Beckinsale and Charlotte Bowe was held at St. John’s on Saturday 2 June. We held our monthly Coffee Morning in the Parish Room on Saturday 26 May. It starts at at 10.30am and everyone is welcome. Our Walking Group on the 23 May walked round Dunnockshaw. We were blessed with fine weather and enjoyed a fine meal afterwards. We welcomed Masen Ariane and Cruz Ariane for baptism on Sunday 20 May. St. John’s Spring Fayre and cafe was held on Saturday the 12 May starting, raising £1,000 towards church funds. The Heywood and Sudden Cluster Confirmation Service was held at St. John’s on Sunday 6 May at 6.30pm. Eleven candidates were confirmed with Bishop Mark presiding. We held our monthly Taize Service in the Parish Room on Wednesday evening the 2 May at 7.00pm. The Walking Group did a circular walk from Ramsbottom to Irwell Vale and back.on the 25th April. Fortunately the rain held off and in fact, the sun came out from hiding. PALM SUNDAY – 25th March Holy Communion at St. Luke’s 9.30am and St. John’s 11.00am. Songs of Praise at St. Luke’s for Heywood Cluster 6.30pm. Monday 26th March – 7.00pm Silent Prayer at St. John’s and Meditation at St. Luke’s. Tuesday 27th March – 10.30am Holy Communion and 7.00pm Silent Prayer at St. Luke’s and Meditation at St. John’s. Wednesday 28th March – 10.00am St. Luke’s Primary School Easter Service in St. Luke’s Church. 7.00pm Taize Service at St. John’s and Meditation at St. Luke’s. Thursday 29th March – 10.30am Holy Communion at St. John’s and at 6.30pm Passover meal, supper, Holy Communion, stripping of alters, virgil at St. John’s. GOOD FRIDAY – 30th March 10.30am Good Friday Service at St. John’s. 12.30pm Ecumenical Service outside St. Luke’s. Saturday 31st – Getting the Churches ready for Easter Day. EASTER DAY – 1st April 6.00am Eucharist on Vicarage Lawn at St. John’s followed by bacon butties and Prosecco. 8.30am BCP Holy Communion, 11.00 Holy Communion and at St. Lukes 9.30am Holy Communion. On the 28th March The Walking Group had a pleasant and enjoyable walk round Edgeworth and Jumbles Quarry. Members of the congregation had an enjoyable Sunday Lunch held at the ‘Heywood’ after our morning service on the 4 March. Regrettably the Women’s World Day of Prayer, due to take place at St. Margaret’s on the 2 March, had to be postponed due to the inclement weather. A revised date is to be arranged. Held our monthly Coffee Morning in the Parish Room on Saturday 24 February, which was very well attended..
We held a joint service of Holy Communion with St. Luke’s on Ash Wednesday 14 February. Held our monthly Coffee Morning in the Parish Room on Saturday 27 January. On Sunday 31 December 2017 it was St. John’s turn to hold our Joint Service of Holy Communion with St. Luke’s. Friday 29 December saw the wedding of Daniel O’Connor and Jennifer Walmsley. On Wednesday 27 December we held a morning Communion Service to commemorate the anniversary of St. John the Evangelist. Unfortunately our Boxing Day walk had to be abandoned due to heavy rain. Midnight Communion was held on Christmas Eve at 11.30 pm, followed with a Family Holy Communion on Christmas Day morning. Our Crib and Christingle Service with Nativity Play in Church on Christmas Eve was, as usual, a joyful event and well attended, with extra seating having to be provided. The retiring collection raised a generous £254.02, which will be donated to The Childrens’ Society. Our Christmas Celebrations started with a service held at St. Luke’s on 6 December, including our choir at St. John’s. On the 17 December we held our annual Choir Service at St. John’s, with the retiring collection being donated to a Children’s Cancer Charity. Our annual Christmas Shoebox Collection Service was on Sunday 19 November. 135 shoebox Christmas parcels for orphan children in Belarus were made up and donated at the service. Carol Hartley, the organiser for the charity Teams4U, expressed her gratitude and gave a talk on how the presents bring bring so much joy to the children. 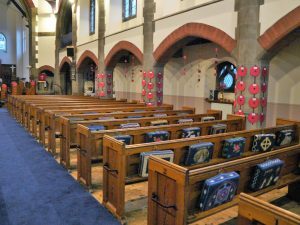 Our Remembrance Service was held in Church on Sunday 12 November. A two minute silence was held and Stewart Warrington played the Last Post in remembrance of the ending of hostilities in the First World War. Our Coffee Morning in the Parish Room on Saturday 28 October was a happy event, raising £283 towards Parish Funds. The Walking Group did a circular walk round Rishworth, Ripponden on Wednesday 25 October. It was somewhat heavy underfoot following the recent wet weather. We held our annual Harvest Festival during our Morning Service on the 1 October. The Service was well attended and generous donations of food were provided. The food was delivered to the Heywood Food Bank the following Monday. Our September Coffee Morning in the Parish Room raised a healthy £180.00 towards Parish Funds. The Hopwood Community Group held an Afternoon Tea in the Parish Room on the 19 September. Sandwiches, cakes and scones aplenty, plus games and quize’s. St. John’s held a Craft & Heritage Day on Saturday 16 September from 1.00pm to 3.30pm. Included was a display of weddings which have taken place at church. Also we had copies of Marriage Registers from July 1920 up to the end of 1980 available, plus some Baptism Registers and Remembrance Books on those from our Parish who died in the First and Second World Wars. 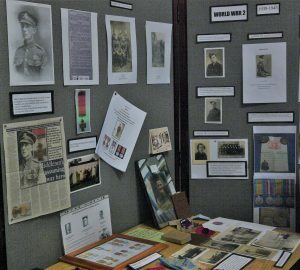 Along with general history memorabilia on display, there were refreshments available, cakes, plus coffee, tea and soft drinks. Crafts include card making, photography, woodcarving, knitted crafts, needlework and paintings. Our Coffee Morning on the 6 September in aid of Rochdale Hospice raised £280. Our August Coffee Morning in the Parish Room raised a healthy £218.00 towards Parish Funds. The Walking Group walked round Phillips Park on Wednesday 23 August. It was a damp start, but ended in brilliant sunshine. The Hopwood Community Group went on a Coach Trip to Llandudno on Wednesday 9 August. It proved to be a bracing sunny day, with many enjoying a pleasant walk along the promenade. With the 30 July being the fifth Sunday in the month, it was our turn to welcome the congregation of St. Luke’s to our 11.00 am Communion service, which was presided over by Rev. Robert Whyborn. On the same morning, some members of our churches attended the Service at Heywood War Memorial to remember those who died at Passchendaele 100 years on. The Walking Group, which is not restricted to Church members, but available to anyone who wishes to come for some exercise and company, walked round Wayoh Reservoir in Edgeworth on Wednesday 26 July. It was a rather damp, but enjoyable, walk and an excellent lunch was had at Black Bull Inn at the end of the walk. The Coffee Morning in the Parish Room on Saturday 22 July was well attended and proved to be an enjoyable occasion, as well as contributing to Parish funds. Our Work Morning on Saturday 15 July 2017 proved very productive in general tidying and maintaining the church, inside and out.